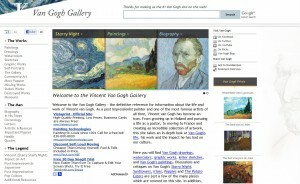 We are thrilled to announce the launch of the redesigned Van Gogh Gallery website. We’ve made enhancements to improve your experience as a visitor to the site and complement the works of Van Gogh. We would like to thank our friends at The Net Impact for all of their help with this web design project. Some of the updates include a rotating banner on the home page featuring images of a few of Van Gogh’s most famous paintings including Starry Night, Almond Blossom, Wheat Field with Cypresses, Still Life: Vase with Twelve Sunflowers, Self Portrait, 1889, Starry Night Over the Rhone, The Night Café in the Place Lamartine in Arles and The Church at Auvers. Website visitors will also now be able to read more of Van Gogh’s famous quotes in the rotating feature at the bottom of each page. Searching for information on the site is also easier now with the search box in a consistent location on every page and easier to read text. The text on each page is also easier to read now too. If you haven’t had a chance to see all of the enhancements, check out the newly redesigned Van Gogh Gallery website. We value your feedback. Please share your comments with us and let us know what you think of the new design.